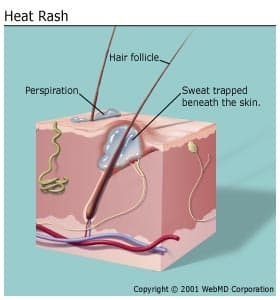 Heat Rash - What Is Heat Rash? Heat rash, also called prickly heat or miliaria, is a common condition in which areas of the skin feel prickly or sting due to overheating. It can itch a lot, but it’s not dangerous. It looks like tiny bumps surrounded by red skin. It usually happens on clothed parts of the body, such as your back, abdomen, neck, upper chest, groin, or armpits. And it usually gets better once your skin cools off. Heat rash happens most often in hot, humid conditions. It's most common in infants. Active people, newborns in incubators, and people on bed rest with fever also are more likely to get it. You can get a heat rash when you sweat too much. The ducts from the sweat glands in your skin become blocked. This causes the sweat to leak into the surrounding tissue, which leads to irritation and redness. You may feel the prickly, or stinging, sensation that gives this condition its name. Move to a cooler, less humid place. Don’t scratch your skin, or it could become infected. Don’t use ointments or creams that keep your skin moist. You can put powder on the rash to feel more comfortable. Wear clothes that aren’t tight and don’t trap heat and moisture. The Merck Manual Home Health Handbook: "Prickly Heat." Ely, J. American Family Physician, March 15, 2010. O'Connor, N. American Family Physician, January 1, 2008. Habif, T. Clinical Dermatology, 5th ed, Mosby, 2010. Health Direct: “Summer skin rashes." How Can You Stop an Itch?